JDS Architects is pleased to announce the nomination of its project Kalvebod Waves for the Big Arne Award. The award is given to completed works and initiatives that have raised the architecture of the metropolitan Copenhagen area in the past year. 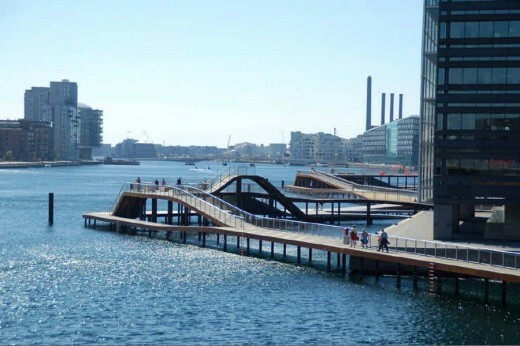 Kalvebod Waves is nominated for the award because it contributes to reuniting the city of Copenhagen with its harbor. To create this urban spot on the waterfront, JDS Architects teamed up with KLAR, Future Experience, U-turn and White Water Adventure Park. Today, Friday, the 30th of August, marks the official opening of our harbor front project in Copenhagen, KALVEBOD WAVES, collectively designed by KLAR and JDS/JULIEN DE SMEDT ARCHITECTS with the support of Sloth Møller and Niras Engineers. Join in for a host of activities from sail tours, walking tours, drinks, DJs, and of course kayaking and swimming. For the inauguration, Copenhagen’s Technical and Environmental Mayor, Ayfer Baykal, will guide a boat tour of the Kalvebod area. At the turn of the millennium, the center of Copenhagen was given an incredible breath of fresh air or rather fresh grass by the opening of Islands Brygge Park. The project injected some 28.000 m2 of outdoor space for all. In 2003, we, as PLOT (now JDS and BIG) designed the harbor bath project, which introduced a new concept of bathing and water sports to the capital. The success was immediate and the first real signs of the city turning itself back to its waterways became evident. Today we’re thrilled to invite you all to experience the next phase of development of this long term plan: the city side of the harbor, the Kalvebod Pier (Kalvebod Brygge). Historically this part of the harbor was devoted to industrial activities. Then in the 80’s and 90’s, the city developed the area into an architecturally austere mono-programmed harbor front, leaving its quay barren and open to strong winds and deserted by citizens. When addressing this infamously gloomy and desolated side of the harbor, we put our focus on two major design aspects: to create urban continuity and to locate ourselves on the sunny spots of the water. What has doomed the Kalvebod area until now were the long shadows drawn by the imposing structures fronting it. We studied the course of those shadows throughout the day and the year and located two main pockets of shadow-free zones. We decided to program those areas as resting islands on the water. From there on, all we needed was to find an active way to reconnect those islands to the urban network and to make them relate to the city’s infrastructure. The original project extended that connective idea all the way to the nearby Langebro Bridge, allowing our project to completely connect and extend the Islands Brygge Park. We believed in the potential to drag the success of the nearby park onto this side of the harbor in the same way as we had dragged people from that park to the harbour bath 10 years ago. The bridge connections ended up being too costly and that part was dropped which in turn placed all our focus, energy and budget on the core of the project: the city side promenade, the two main squares and the programs to activate the entire complex. Kalvebod Waves brings a myriad of activities from organized to spontaneous: there’s a kayak and canoe club inserted in the project, a docking island peacefully floating in a basin, a series of benches and long resting areas to enjoy the sun. Since ‘the Waves’ partially opened 6 weeks ago, it has already become a magnet for urban life and water activities. Budget: DKK 52 mio., Euro 7 mio.